May 7, 2012 July 31, 2012 Hawaii House Minority Representative Gene Ward Ph.D.
Hawaii’s fiscal year begins July 1 and runs through June 30. This is different from the Federal Fiscal year with runs from October 1 and ends September 30. The total operating budget for FY 2012 is $10.8 billion. “The Governor shall submit a six-year program and financial plan, budget, and program memoranda to the Legislature in each odd-number year. The six-year program and financial plan and the budget are usually combined in a single document. The budgets of the judicial and the legislative branches are submitted by their respective leaders to the Legislature for its consideration. In each regular session in an even-numbered year, the Governor may submit to the Legislature a bill to amend any appropriation for operating expenditures of the current fiscal biennium, to be known as the supplemental appropriations bill. I have been in opposition to this bill, and I still am opposed to this measure. Although the Governor’s Justice Reinvestment Act contains some good features, I think this is primarily a cost-saving measure for this Administration and not true prison reform. Let me just mention the parts that I like. First, and long overdue, attention will be paid to increase restitution paid to victims of crimes. Second, bringing back prisoners from the mainland to be closer to their families. Third, released prisoners will be offered more programs to help them re-integrate back into society. Fourth, releasing prisoners will save money. Since housing them now costs $190 M, any savings would be appreciated. And considering that we spend only $8,000 per public school student, we can prioritize the money into our educational system. 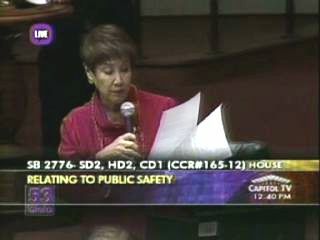 However, there are features in this bill that may be detrimental and even dangerous to public safety. This bill is based on recommendation of the justice reinvestment working group working with the Council of State Governments Justice Center. It aims “to improve the criminal justice system, relying on the Department of Public Safety, Hawaii Paroling Authority, and Adult Probation Services to effectively implement changes to policies and practices”. It will do this by reducing (and I quote Part I of the bill) “the current incarcerated population and generate savings of approximately 500 beds and $9 Million by the end of fiscal year 2013, 850 beds and $19 M in fy 2014 and 1,050 beds and $26 M in fy 2015.” That means the first year of the program 500 prisoners will be released, year 2, 350 more prisoners, and 200 more in year 3! In my humble and uneducated estimation, this is kapakahi! I think we should start out small and enlarge the program gradually. Why start the first year with 500 releases? I also question whether we will have the necessary programs and personnel in place for Year 1. Will drug and alcohol treatment, counseling, vocational training, or halfway houses be ready? Will there be jobs for these people? The plan outlines releasing 1 050 prisoners in the first three years of the program, and it will sunset in 2018 – 6 years. 2018 is when this Administration hopes to exit the scene, so that’s why I wonder whether this is prison reform or a cost-saving device. The program, as described in the Working Group Plan and in earlier versions of this bill, called for the release of Class A felons 18 months before the end of a their terms. Class B and C would not be released as soon. Why is this? I would release Class C felons sooner than Class A felons. This may increase the danger to public safety. Even with programs supporting released prisoners, the recidivism rate approaches 50%. I share Honolulu Prosecutor Keith Kaneshiro’s skepticism. We should “go slow” in releasing prisoners and have people and programs in place to better the chances of success. This is critically important – for the sake of the released prisoners, their families and the community. I believe my constructive criticisms this session will help shape a better program. We should go back to the drawing board to re-examine the features of this release program. Job 1 is to consider long-term reform and public safety – not short term cost savings.